Direct global connection to your machine's CAN-bus via the internet − in realtime. Remote bi-directional connection between your computer (e.g. Service Tool) and your machine's CAN-bus via the internet. Perform a diagnosis session or remote update (FOTA) directly from your existing OEM service tool by integrating the Realtime Client. To establish a remote connection to your machine with the Realtime Client use the CANlink® mobile as a wireless gateway (LTE/3G/2G). 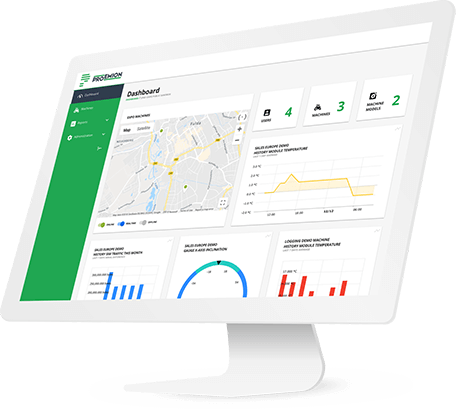 The Real-Time Dashboard is a desktop application that provides a near instantaneous representation of all available CAN data from your global fleet. This enables you to keep constant watch over the status of your operations, while being able to instantly diagnose issues as they come up. Traditionally, diagnostic data was only available on-site. Now you can diagnose errors anywhere in the world more quickly, and with more accuracy. Thus reducing or even eliminating downtime. A wide variety of visualizations are available, including cockpit instruments, status indicators, and much more. Arrange each display however you like, without any need for programming. All you need to do is to plug in the Proemion CANlink Mobile Module, and you are ready to go. No additional hardware is required, and the software needs only minimal configuration. Here is a simple example of how the whole system works. Telemetry and sensor data is continuously measured e.g. temperature, speed, location etc. Data stream is continuously analyzed. Alerts are generated in case of a threshold exception. User can continuously monitor status, and instantly act on any alerts or error codes generated. With the Proemion Real-Time Dashboard, you can record all diagnostic sessions and store them in the cloud. It is possible to perform error analysis at any point in time. Thus, an engineer can run a diagnostic session in retrospect and retrospectively perform data analysis. This provides the advantage of being able to work offline without an internet connection. Session histories can be logged via the Dashboard-Tool, for example the timeframe and amount of recent connections. A complete connection history of all CAN messages ensures consistent transparency. Each vehicle or machine access gets recorded and can be evaluated: Who (IP) connected when (time), from which place (IP) and with which vehicle (vehicle number). Vehicle and machine manufacturers use different CAN protocols. In the United States, J1939 is used widely, while Material Handling prefers the CAN-Open-Protocol, and agricultural machine manufacturers mainly use the ISO bus. But all protocols are CAN-based protocols. We designed the Real-Time Dashboard to display CAN data from multiple sources. All CAN standards can be thus be individually adapted to various CAN messages using RMtools. In addition, the layout and presentation of the software can be adapted quickly and intuitively. Developer and support personnel can customize their own graphic layout, and display the required vehicle data as desired. The various visualization tools can be combined and linked mathematically or by individual preference. No matter how complex your fleet setup may be, it can be accurately represented using the available visualization tools. It is also possible to detect errors in advance and forecast maintenance. This "predictive service" can initiate measures for preventive maintenance. 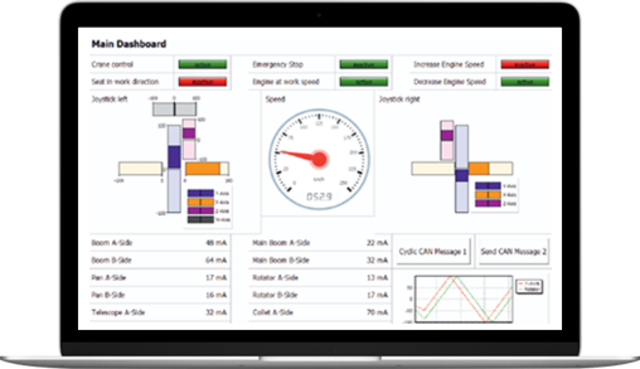 The Real-Time Dashboard and Proemion server combination also allows for off-site troubleshooting and error diagnosis. Our solution provides bi-directional communication. Not only is it possible to read out CAN messages from any vehicle or machine, but also to send messages back to the asset. This provides the great advantage of performing global firmware uploads. All vehicle and engine components integrated in the CAN network can be flashed. 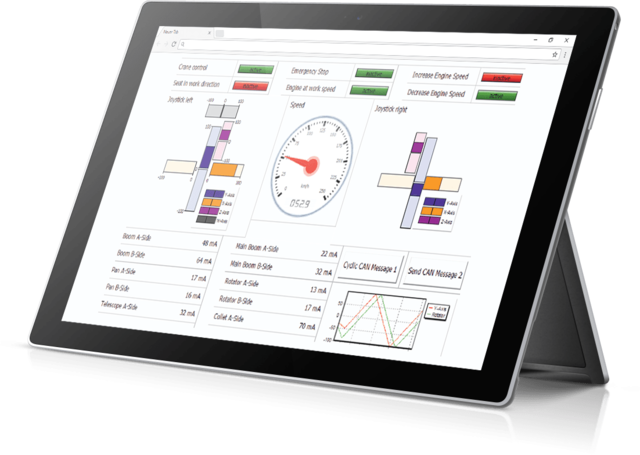 Proemion diagnostic software monitors the performance of new software updates. Error detections result in appropriate adjustments or a re-flashing of respective components. Accurate diagnosis and remote fixes are thus possible, from anywhere in the world. Proemion functions on its own based server solution. Customer data is stored on our worldwide server farm, monitored and managed by our in-house data center. All our solutions include multiple end-to-end security options & tools to protect personal data. We comply with all the strictest US and EU requirements. Also, our internal database redundancy provides extremely high security standards for stored customer data and machine values. Thus, we place great emphasis on adherence to German data security regulations, which are among the best in the world. The PEtools SoftGateway provides a connection to two CAN networks remotely, which enables the exchanging of CAN messages between these networks. You are able to access multiple CAN networks without having to extend your own applications. This greatly simplifies setting up and maintaining your CAN monitoring system. CAN message settings are highly configurable. This enables you to allow or block certain CAN messages through the SoftGateway. This reduces redundancy and bandwidth requirements.